The new NCR Post and Go Pack was mentioned last month and we can now show the actual pack and stamps. As explained on the reverse of the pack, the 'Service Indicia' which was previously printed on plain white labels is now printed on Post and Go stamps (or Faststamps). These stamps (with the same values) are readily available at Post Office branches with the NCR self-service machines, the number of which will increase from the current 225 (mix of old and new machines) to over 700 by the end of 2015. 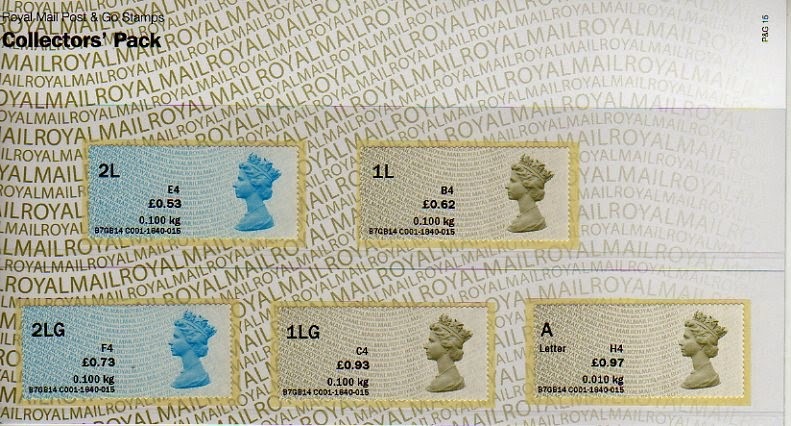 The stamps in the pack have a different datastring to those from the machines, however, and don't even mimic the 'live' versions which have kiosk numbers 67 upwards. These have a datastring similar to that in IAR and previous exhibition machines and so unlike those from either the Wincor-Nixdorf or NCR machines. The 1840 is supposed to be the session number and 015 indicates the pack number (this is the 15th Post and Go presentation pack). The pack doesn't explain the VAT codes which are (in sequence as shown) E4 B4 F4 C4 and H4. * The July Philatelic Bulletin quotes this as C002 but that is wrong. Also, both brown and blue stamps show Reel B. If nothing else this shows that they are not printed together, but in two very separate major print runs. Royal Mail are not producing first day covers of these stamps. One good thing to come from this is that Tallents House are using up old stocks of base stamps, the blue stamps being coded MA12, and the brown undated! Are you sure that the B is for roll B and not for the B series (IAR) machines. I’m assuming that the stamps are machine printed and not litho/gravure printed as the Machin & Birds packs were. If the BPMA is going to have a graphic added (what could possibly go wrong…), could we be seeing this type of service overprint for this exhibition. That’s always assuming the machine isn’t trying to download a non-existent download, which it is doing every time I visit. Being pedantic, the VAT codes are only applicable for use with England, Wales, Scotland & Northern Ireland and Europe and not Jersey, Guernsey/Alderney who are regarded as rest of the world, who’s stamps bear a 5 in the code (Not sure about the status of the Isle of Man). Re the B, I'm quoting from the pack, where it actually says Reel not roll (my eyesight!). Why would it be an IAR when it is showing NCR formats, now that WOULD be perverse! VAT *codes* are relevant for mail to the whole world. Inland letter post, signed for and Special Delivery are exempt, and so the 'exempt' code is used. Special Delivery 9 am & SG are standard rated, so the 'standard' code is used. 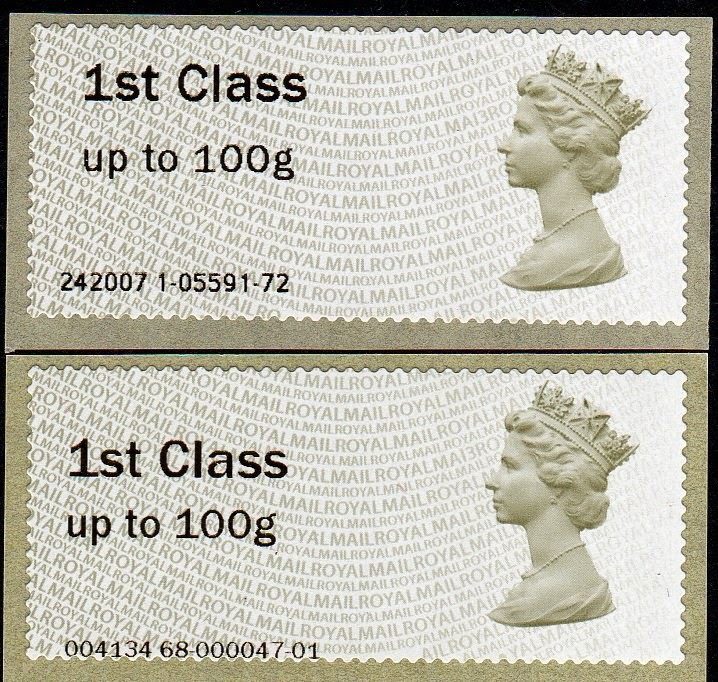 International Standard Letter Mail (ie up to 100g) is exempt. International Standard Small Parcel mail (ie anything over 100g) is Zero-rated, which is not the same as Exempt. Including Signed and Tracked&Signed are Exempt including Small Parcels. International Tracked is standard-rated to EU, zero-rated for Rest of the World. Covered by the Inland Mail Scheme, the Isle of Man is within the UK VAT scheme, the Channel Islands are not and are not in the EU either. The images do look like a combination of NCR OVs and IAR font and data string. In reality, there probably litho printed by Walsall like the Bureau’s original packs. However IAR’s website does seem to indicate that C001/2 are their machines, which appears to be supported by what John wrote in ATM Informer issue 14 (bottom of page three and beginning of page 4). So Tuesday could see a new set of Post & Go’s IAR printed OV stamps, with supporting text which if they are using the illustration from the 2nd Class pack (PG10) may or may not be accurate. On the plus side, if they are still available when the postage rate goes up next year, the price of this pack will remain the same. "On the plus side, if they are still available when the postage rate goes up next year, the price of this pack will remain the same." Now that's a very interesting point, and one which modern postal historians will probably explore. As readers will recall, the equivalent labels from the Wincor-Nixdorf machines are time-limited, whereas those from the NCR are not. So here we have a set of stamps with service indicators (suggesting NVI) AND face values. That must make them unique as 'stamps' rather than 'labels' ? These stamps are thermally printed on IAR machines - hence the IAR data string. They are a hybrid version or 'representation' of the NCR OV Stamps. The 'C' indicates they have been printed in bulk and have a fixed session number etc. The VAT codes only have relevance for internal Post Office accounting purposes - not their postal validity. They are valid for their face value 'for ever'. In that case they are neither one thing nor another, and bear no resemblance to any operationally produced stamp/label. People will want them, because they exist, and because they are valid for posting, but being a hybrid - no, hybrid is too good a word - being a mongrel, the offspring of a marriage between NCR and IAR, they are a false representation. Err - I think that depends on what happens next. Think of them as a new pedigree rather than a mongrel !